Ian Page has written a book that will change the readers view of how the typical apocalypse novels play out. This is unlike anything I have read before. One key difference is the apocalypse is not triggered by zombies, or a nuclear war that leaves the planet desolate. Instead there is a sickness that strikes in what appears to be a random selection of people. It is taking over the world, people and animals. Another refreshing difference is the main characters are not your typical white Americans. The first two characters that you meet are women, Deeta Nakshband, a doctor that was born in India and whose family moved to the US, and Janelle Jefferson, also called JJ, a bodybuilding black women from Bridgeport Connecticut. Both women have military experience. This breaks from the traditional lead characters you find in novels and puts this book in it’s own category from the start. Another key difference in Sanctuary is Ian Page’s ability to write like you are living with the characters. Most books focus on the action and fast track the reader though one action scene to the next throwing in some personal information in-between, sometimes feeling awkward or like you are looking back in time. Page brings the characters to life through their interactions with each other in the mundane day to day activities. Things like making a cup of tea, eating dinner, or working out are all part of the daily interactions that make the characters come to life. You really get to know them as they live and not just a quick bio to push the plot along. This personalization of the characters is what draws the reader in and keeps them turning the page to see how they all interact. I kept wondering, who will make it through this alive. Some of the other characters in the book are Gary, who is a Buddist monk, adventure climber, and skilled fighter, the couple of Wesley and Hakura, that bring their own set of servile skills to the group, and various other doctors and family members. The world is coming apart all over. There is another world war brewing and hate crimes are skyrocketing. Reminiscent of the internment camps that were created in WWII for the Japanese citizens, Muslims are being rounded up as terrorists and detained for questioning. Deeta’s family tries to hold together despite many losses and terrifying close calls. She realized she needs to get her family and friends to a safe place. All the preparations that her collection of friends have been making are put into action and they set out for what is called the Sanctuary. Santuary is a realistic contemporary story that plays off many of society’s current fears. Page talks about the conflict between North and South Korea, the conflict in Muslim countries, the fear and hate that infects society all through the world. All these modern and current issues are played out this this complex novel. The underlying message I feel though is that there are still good people out there that want to help others and are willing to do what is needed to keep society from falling into total despair. If you are interested in modern timelines and current events this is a great novel. It is gruesome in its details at times. The murder scenes are vivid and plentiful. It’s an interesting look into the human mind and how people handle the stress and complex situations that the mass sickness brings out. Ian Page gives readers a glimpse into what humans are capable of, both good and bad. 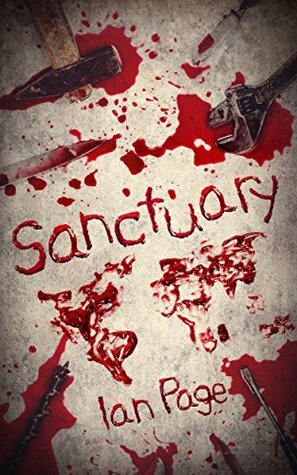 Sanctuary ends in a way that leaves room for a sequel and there is more than enough action left to happen, and many questions left unanswered as the book draws to a close. 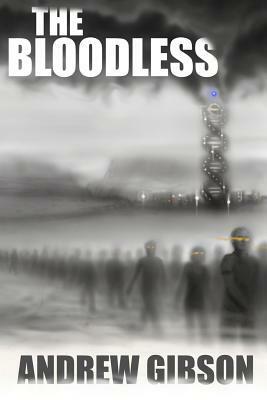 The Bloodless is about a small makeshift band of soldiers and weapons experts that take on the evil GoD Labratories. What was your inspiration for GoD Laboratories and how they bring about the undead? A lot of the inspiration was drawn from big box companies of today. Some media companies basically do what they want and while there are people who object to their practices, there isn’t much that can be done to stop them because of their deep pockets that afford them virtually unlimited power and they supply services people need. GoD is like that but in a society that has seen science replace almost every deity based religion on the planet, they are practicing what people believe in. So a level of support is there for them but as with any company, they overstep their bounds and take things too far. On one hand they provide critical services to society (i.e. cures for diseases, life extending drugs, and research that benefits nearly every aspect of life) but the other hand delves into parts of the natural order that nobody has dared to explore for mostly ethical reasons. The Bloodless did a great job in delivering action packed zombie killing fun. How did you balance the blood and gore inherent in zombie novels with character development that we see in successful franchises like The Walking Dead? There has to be an ebb and flow to any story that is told. When I’m writing I try to think of concerts. In any good concert you go to you will notice that the music selection is varied in a way that lets the audience catch their breath. I, too, want my audience to be able to catch their breath so I try to change it up after an intense moment of combat or violence. Also, things need to be explained, motives and causes, so you can’t just have it be balls out all the time. Readers need to understand the intent behind the characters’ actions/choices, so making sure those moments are included is a big part of my writing. Justice started out as a hard pragmatic scientist and then develops into more of a hero type. What do you think were some of the defining moments in his characters development? Simply put: loss. Loss is a huge motivator/catalyst in anyone’s development. First he lost his wife and son, usually that is enough to drive anybody to do whatever it takes to right the wrong. Then he loses the love of his life, Crist, which he feels somewhat ashamed of but knows it to be true. But it’s also his successes. Successfully infiltrating those substations based on plans he developed helped him realize his worth. He deals with the loss in his own way but understands that its inherent with the role he has taken on. A lot of times leadership roles are thrust upon the protagonist, it’s not often you see those characters put themselves into the role, there is definitely a learning curve with Daniel but like any good scientist, he learns best from trial and error. Zombies are a popular fiction today. How does The Bloodless stand out from the rest? I think a lot of zombies that are popular in media these days are typically born from a virus, something that is transmitted from a bite or scratch or some type of physical contact. The Bloodless are different in the fact that the genetic structure of a person is being altered and the only thing spreading the “disease” is The Cloud. I think the only similarities that exist are the fact that the body had to be dead at some point and the mindless desire to kill. Classic zombies are driven by the need to feed on fresh human flesh, but the Bloodless have something else driving them, an outside influence rather than instinct. Also, there are two levels of “undead.” One is those who were reanimated within GoD labs, those are the people who regained the ability to talk, think, and feel and have a superhuman ability to generate. Two; are those who were born from The Cloud, these are the mindless killing machines. Both play an important role, roles that will be further explored in the upcoming installments. I hope the series continues in other books. If so, where will the story take readers? 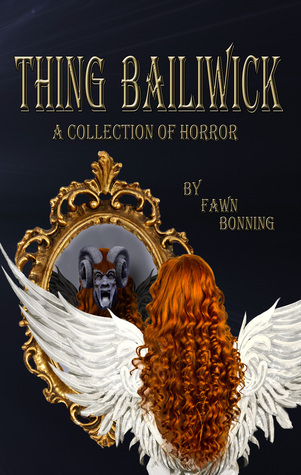 I am actually nearing the end of the writing phase of book 2 out of a 3 book series. At least 3 books. I am not sure if the series will extend into anything beyond 3, we’ll have to see how things progress. I can tell you that the second book aims to tie up most of the loose ends from the first book and that there will definitely be a final showdown between Daniel and Mendel, because there has to be, right? It’s hard to say anything without giving too much away but I definitely go into more detail about the backgrounds of the individuals fighting alongside Daniel Justice. There is also a brief foray into the world outside the tiny bubble around the GoD campus, which makes for an interesting contrast. However, if you want to know more, you’ll just have to read the next book which I am hoping to have out mid to late spring. The year is 2100-something, Daniel Justice is just another geneticist working for GoD Laboratories, a big box, publicly traded biotechnology company. Then one day he proved that resurrecting the dead was not only possible, but economically viable. Back in the old days, this would have been a massive ethics debate, but in a world where religion is all but extinct, the conversation is a whole lot different. The Bloodless is a story of a small makeshift band of soldiers, weapons experts, and one pacifist (who is paradoxically a weapons designer) that are taking on the world, both living and undead. The battle began when GoD Laboratories, a company which began the first reanimation of dead humans, had an unfortunate “event”. Shortly, after “The Cloud” happened and another version of the “undead” was created. Daniel Justice, a former high-ranking GoD scientist who worked on the “undead” experiment, lost his family to the “undead” (“Bloodless”) and became a prime target for one of the Bloodless in his experiments. He wants to make things right, but to do that he needs to get back to the compound safely and end the death toll left by the Bloodless. In a world facing this kind of danger, Justice is understandably not the hero that anyone would like to see. He is, however, the only person that might be able to keep that world from becoming Bloodless. With his band of ragtag weapons specialists, Justice leads the mission toward destroying the evil-manufacturing compound that used to be his former job. The first thing that really stood out was the originality on the same old zombie story. The Bloodless find creative ways to create new types of zombies. There are the traditional zombies, but there are also fast-moving and highly intelligent ones with military training and a tendency toward cruelty. The two stand out features of this book are its conciseness and use of flashbacks which complement each other. Bloodless doesn’t take a lot of time offering background details or extended character descriptions. Instead it focuses exclusively on action and allows the reader to connect the dots through the use of flashbacks. The book begins with Jackson and his in an intense fight and ends with that same team fighting for their life. Throughout the race to complete specific missions, readers gain small insights into the characters. Justice becomes less of a cold scientist and more of hero trapped within a maze of evil that is bigger than him. Crist becomes less of a mysterious (yet paradoxical) stranger, and more of a reason for Justice to continue fighting. While I enjoyed how concise the book was I had an issue with the overuse of clichés and loose ends. The book played a little too close to the stereotype for most characters. Almost everyone in the book seemed to fit the composite of the well-muscled hero or heroine who knew how to use a weapon. Overall, the book reminded me of “The Walking Dead” mixed with characters from the “Expendables”. The book was intriguing, a well-paced plot, along with a unique approach on the zombie theme would make for a great read for action/adventure and zombie fans. I look forward to the rest of the series.